Design the perfect storage solution for your business. New shelves with removable polyethylene shelves in straight or angular sections. In our eagerness to improve and respond to the needs of our customers, in Reysan we have expanded our range of industrial furniture. Specifically, we have added new modular shelves for universal organisation and storage: the shelves built in Duralinox on which the polyethylene shelves are housed. Duralinox is a type of anodized aluminum alloy of great hardness and resistance. This type of alloy is known in the world of catering and food. Its durability over time without erosion and its ease of maintenance and cleaning is ideal for use in cold rooms, commercial kitchens, warehouses, laundries, and so on. Professionals in the food industry appreciate this type of organizational modules for their easy assembly and installation as well as for their safety in maintenance and cleaning. Duralinox shelving comes with the NF Food Hygiene certificate, which guarantees manufacturing quality and hygiene in use. Among its many qualities, we can appreciate its great resistance to low temperatures of up to -30 º C, making it the ideal product for the equipment of cold rooms. 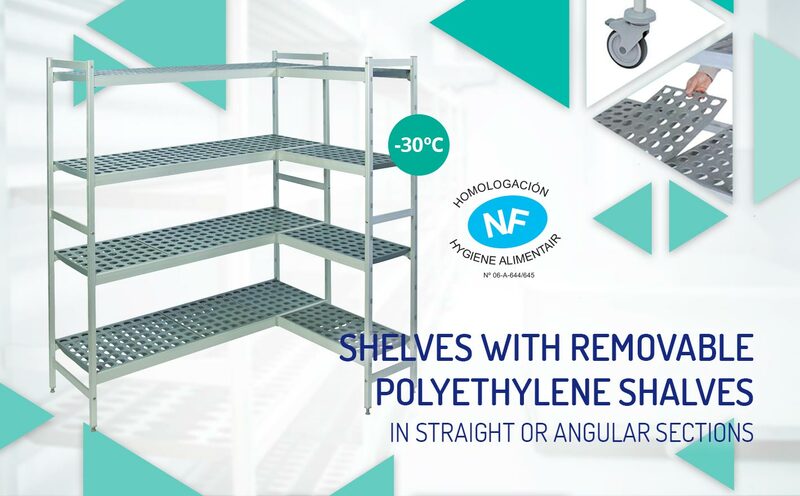 Its removable polyethylene shelves are very resistant and can be machine washed frequently (-30º +90º C). Ideal for the prevention of bacterial contamination. The multiple combinations of standard modules make these shelves the efficient and universal storage system. Depending on the installation requirements and the size of the available space, there is a tailor-made storage solution. By means of conical clamps with assembly flanges, this rack installs the modules in right linear, "L", "U", "T" and "cross" angles. They have accessories such as adjustable legs, angles to place the different grids at different levels and casters to facilitate effortless movement. Get to know in depth the different elements that make up a Duralinox shelving system and design your perfect storage solution.